Because leggings are the only acceptable form of pants. 1. A color block long-sleeve for quickly throwing on in the morning with a comfy pair of black leggings and some ankle booties for an effortlessly adorable look. Get it from Amazon for $15.99 (available in four colors, and sizes S–XL). 2. A turtleneck handkerchief tunic to feel comfy in all day long. Seriously, just looking at this shirt makes me feel comfy. Get it from Amazon for $21.99 (available in seven colors, and sizes S–3XL). 3. A floral peplum top that'll carry you through the seasons: alone during the spring and summer and then you can pair it with a cardigan in the fall and winter. Get it from ModCloth for $39 (available in sizes XS–4XL). 4. A cable knit sweater for what is inevitably gonna become your new favorite sweater in your wardrobe...and for good reason — it's comfortable, it's trendy, and oh yeah, did I mention it's comfortable? Get it from Amazon for $35.99 (available in five colors, and sizes S–2XL). 5. 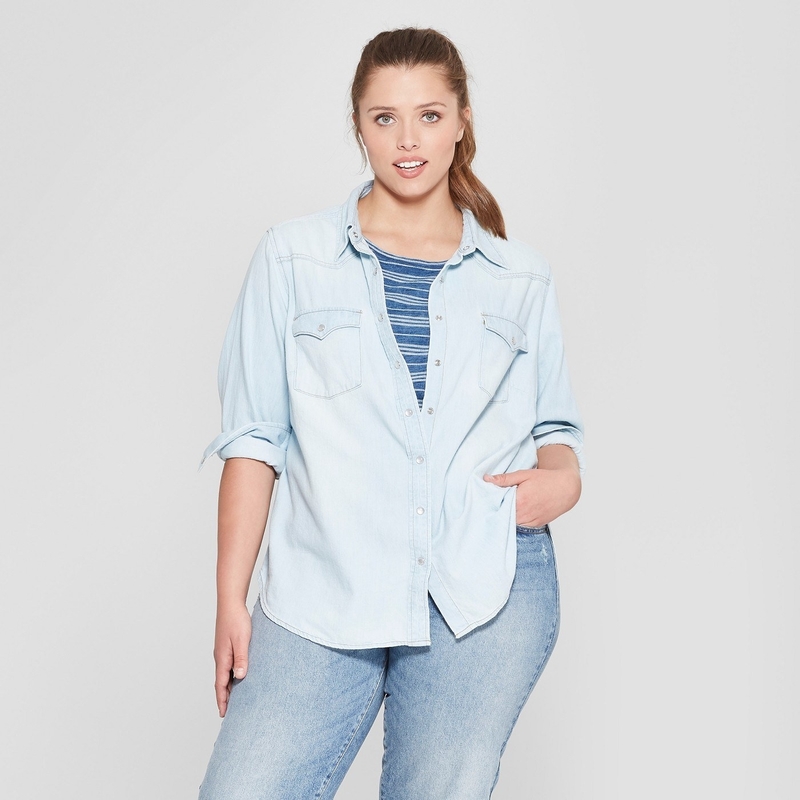 A striped button down shirt to wear a million different ways, but you're here to find shirts to wear with leggings, and this is especially perfect to wear with leggings. Get it from Urban Outfitters for $54 (available in three colors, and sizes XS–XL). 6. An ombre sweater that'll become a regular in your weekly rotation, maybe even daily rotation. Hey, this shirt is amazing, why wear anything else?! Get it from Nordstrom for $109 (available in three colors, and sizes 1XL–3XL). 7. A round neck tunic for a top simple enough to wear any time and any place, but with some button detailing, because you aren't a boring betch. Get it from Amazon for $15.99 (available in 10 colors, and sizes S–2XL). 8. An oversized knit to throw on with your leggings and boots, and then head on over to Starbucks to get a hot drink for accessorizing. Get it from Amazon for $35.98 (available in four colors, and sizes S–XL). 9. A Boho-inspired top that'll have everyone you encounter when you wear this wondering if you just walked right off the runway....obviously the answer is yes. Get it from Free People for $78 (available in sizes XS–XL). 10. A leopard-print tunic for showing off your fiercest side. Literally. Because leopards are fierce AF. Get it from Forever 21 for $32 (available in sizes 1XL–3XL). 11. A button cowl neck to have you wondering why the heck you didn't own this top already because it's so damn comfy. Get it from Amazon for $21.99 (available in six colors, and sizes S–2XL). 12. A lace scoop neck that'll send you twirling and spinning around so you can show off your adorable top. Get it from Amazon for $20.99 (available in 10 colors, and sizes S–2XL). 13. A floral cold-shoulder for when you're dreaming of warm weather days. Until they come back, you can throw this babe on with your favorite cardigan and still look cute. Get it from Amazon for $15.99 (available in eight colors, and sizes S–2XL). 14. An oversized camo T-shirt to wear on days you wake up in the morning just wanting to be comfortable, but of course, without having to sacrifice trendiness. Get it from Boohoo for $9.60 (originally $24, available in sizes 12–24). 15. An oversized pullover that'll beg to be purchased in every color, and I bet you'll have a hard time resisting, hehe. Get it from Amazon for $15.99+ (available in 16 colors, and sizes S–2XL). 16. 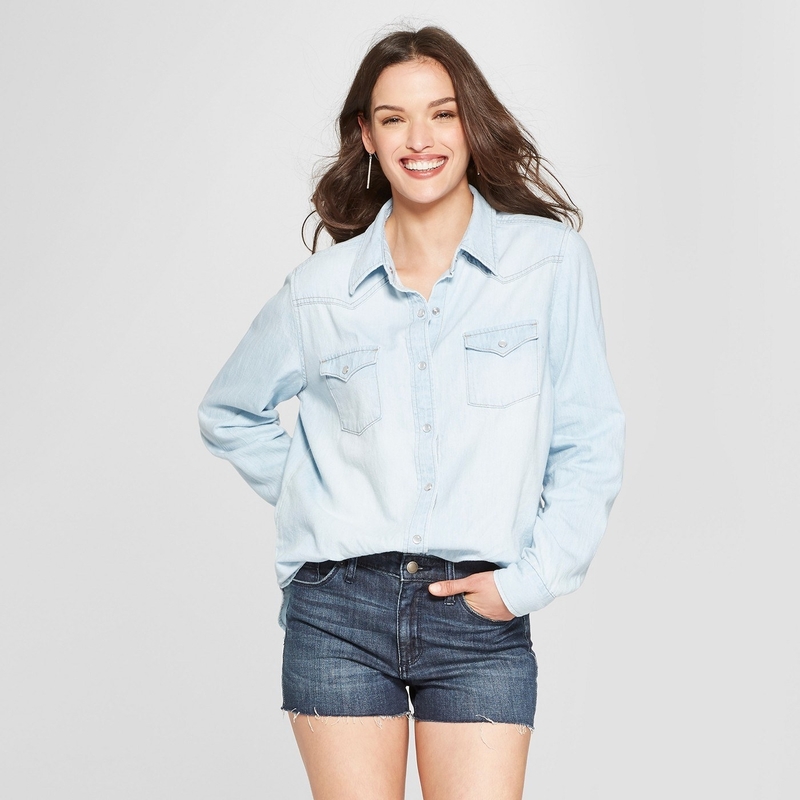 A long sleeve denim top — wear it buttoned up to the collar or open it up and pair it with a tank top. This should be a staple in every wardrobe. Get it from Target for $19.99 (sizes XS–2XL), or $22.99 (sizes XL–4XL). 17. A long sleeve cowl neck with plaid sleeves to wear on days when you feel like answering the following question repeatedly: "Where it the heck did you find such a cute top?" Get it from Amazon for $4.59+ (available in five colors, and sizes S–5XL). 18. A rugby tee that'll instantly become a go-to. It's soft, comfy, and you can't go wrong with basic stripes in pretty colors. Get it from Nordstrom for $23.40 (available in two colors, and sizes 2XS–4XL). 19. A laced-up shoulders top for those who can clearly see in this picture alone how great of a shirt this is to wear with leggings, no further explanation needed. Get it from Forever 21 for $12.90 (available in two colors, and sizes S–L). 39 Pieces Of Clothing That'll Make You Say "Damn That's Cute, Amazon!"